One of the most frequently discussed and debated topics in home remodeling and renovation is siding. Whether it’s a matter of repair or complete replacement, there is a wide variety of siding options available on the market today.The ideal siding for a particular home or commercial building depends on several factors—from the climate to the construction budget. As a result, it can be a challenge to find the perfect fit for your goals. At Global Home Improvement, we carry the latest siding designs from top manufacturers. We can help you choose the right siding for your home, as well as provide maintenance tips to enhance its appearance and lifetime. If you’re concerned about energy efficiency, ease of maintenance and upfront cost, your siding professional can discuss all of these details and more. To request a free siding installation cost estimate, call us at 1-855-201-7963 or click the button below. We are your trusted siding contractor in Doylestown, Ardmore, Cherry Hill and nearby. "Price was lower than competitors and some materials quoted..."
Vinyl siding is certainly one of the most popular and affordable options out there — and it’s easy to see why. Lower production cost, improved energy efficiency, little maintenance and enhanced curb appeal are just a few of the reasons why vinyl is an excellent choice. Choose fiber cement siding if you're after a wood-like texture that resists rotting, warping, and more. 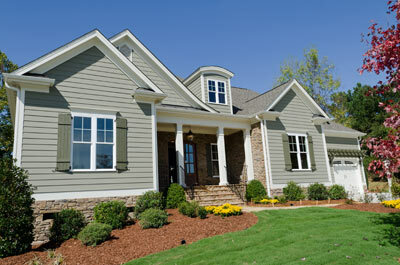 Fiber cement siding is made to last, comes in a variety of colors, and comes with extensive warranties to back it up. Stone siding can be made of various materials. Some can come from a harvest of real stones, while others are made of convincing looking faux-stone products. At Global Home Improvement, we offer manufactured heritage stones that are handcrafted to produce unmatched natural effects. Originally created as a less costly alternative to wood siding, aluminum siding is very inexpensive, easy to maintain, fire-resistant, and comes in many different colors. However, aluminum is prone to dents and fading, meaning it may not be the best choice for especially windy or storm-prone areas. Charter Oak® Energy Elite is a specific brand of insulated vinyl siding that can improve the look and feel of your home. Not only does it reduce energy costs in your home, but it allows your home to be at its maximum energy efficiency so that you don't have to stress when the utility bill comes. Your home can greatly benefit from having Charter Oak® Energy Elite installed. It can withstand harsh weather conditions and provides a visually stimulating look to the outside of your house. Charter Oak® Energy Elite is more breathable and durable than regular siding and comes with a lifetime warranty. Alside Prodigy Siding offers exceptional resistance to heat flow which translates into utility costs savings. AZEK began with a simple goal in mind - to offer a beautiful yet low-maintenance option for exterior trim. In business since 2001, AZEK has since built upon their success to offer some of the best looking, durable PVC trim options on the market. AZEK trim is made from cellular PVC that consistently offers protection against the elements. Available in Traditional and Frontier finishes and many color options, you can completely customize the exterior trim details that your home is lacking. Regardless of if you're trying to sell your home, if your existing siding was damaged in a storm, or if you're just looking to update your home's exterior, the siding contractors at Global Home Improvement will work with you to figure out the best solution for your home. Along with our siding installation services, we also offer stucco remediation if your stucco siding has been damaged in a storm. Additionally, all of our products come with extensive siding warranties. Contact us today to request your free siding cost estimate for your project in Woodbridge, Morristown, Bethlehem, Princeton, Short Hills, Jersey City, Reading or nearby.